How to make columns highlighting, depending on the value of the column - Fast Reports Inc.
Matrix reports are a great tool for analyzing data. In essence, the matrix in analytical reports is a summary table. "Conditional allocation” is often used to facilitate the analysis. This is a regular tool in FastReport.Net. Conditional highlighting implies highlighting the data cells with color, font, or icons, depending on a given condition. But, conditional highlighting works with individual cells. But what if we want to select entire columns depending on the value in the header? For example, to highlight the weekends. In this case, you will have to resort to the "omnipotent" script of the report, regular color highlighting will not help here. The idea is to find columns with values in the headers that satisfy the condition. In this matrix, we derive the income of employees by year. In the beginning, we added several variables that we will use in event handlers. These variables store marked columns for rows. Further, before displaying the matrix, we initialize the variables. // Sets the fill color for this cell. Here I need to make a small remark so that you understand the essence of what is happening. The point is that the matrix output when building a report in FastReport is done line by line. Therefore, we save the column numbers for the first row of the matrix. In our case 2 values will fall into the list of marked columns. // The event handler for the cells in the following rows of the matrix. You need to set it for the second row and the totals. In this handler, we find the columns corresponding to the selected columns from the first row and paint their cells in red. Upon reaching the last column, reset the variable for the next line. As you understand, when building a report, the second row of the matrix is dynamic. This means that it will be displayed for each row of data in the source. Therefore, we need to check each row and color the cells in the correct columns. The solution given in the script is unusual, but the only possible one for this situation, because the matrix is built dynamically and does not store the final structure, coordinates and positions of the cells until it is directly drawn on the sheet. Only the template (the one we see in the designer) and the text values of the matrix headers are stored in memory. Therefore, we have to go through all the rows and memorize the columns for coloring. 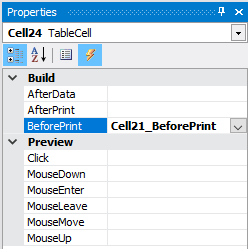 If you want to paint the totals in a different color, you will have to create your own BeforePrint event handler for the cell of the totals, similar to the handler for the [Revenue] cell.